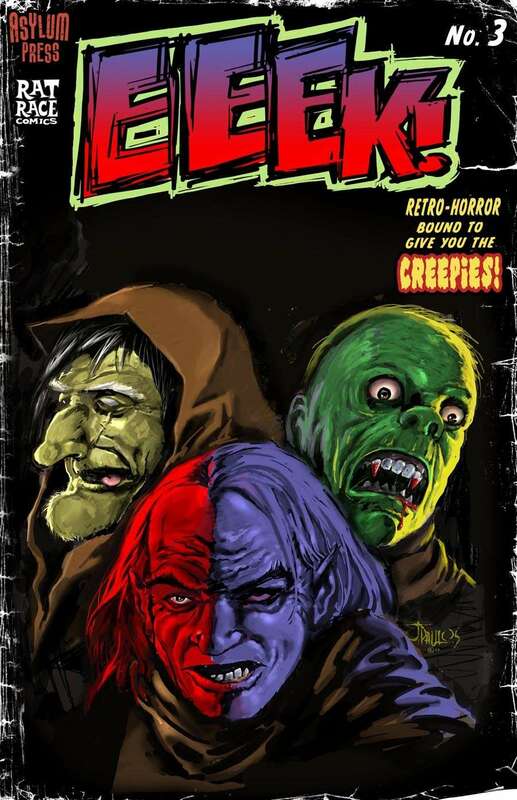 This retro-style anthology of all-new horror tales is guaranteed to give you the eeries and the creepies! Taking a pinch of black humour from EC comics and mixing it with the art stylings of House of Mystery and Warren comics, EEEK! blends a heady broth that hits you like a burning incense stick to the retina. Jason Paulos delivers the goods with tales of revenge, zombies, vampires, ghouls and monsters. Each tale drawn in a different style reminiscent of the B&W horror mags of the 70's and 80's. In 'Witness to Evil' Mormon demon hunters converge on a dark little house with a terrible secret. In 'East Prey' a helpless girl, lost in the wilderness ... but is she all that she seems? Nest up: 'Whats down in the Basement Horace Greely?' --If you hate real estate agents then youll love this tale of greed and bad kharma. We go back to the 60's for 'Head Trip'--This psychedelic little tale begins in a bizarre curio shop ... and ends in a watery grave.